The course is taught in several different vehicles. 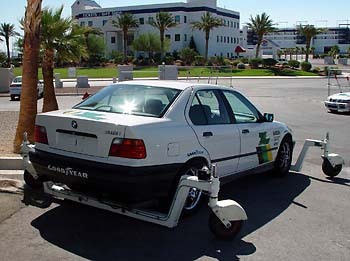 The Skid Car is a specially modified BMW 3 Series with a stout steel frame that is fastened to the car. Caster wheels are mounted to this subframe at each corner on hydraulic jacks. The instructor operates a control box which directs hydraulic pressure to the rear or front casters, which in turn lift the car, reducing weight and therefore traction at that end. The casters are free to spin in whatever direction, so they merely follow their end of the car in whatever direction it wants to go. By lifting the front end a bit, the instructor can simulate understeer, and oversteer is on tap by raising the rear. These cars are set up with very neutral balance. It is very easy to control or induce either understeer or oversteer with brake and throttle. Steering is light with good feedback, brakes are positive with easy modulation. The exhaust systems are quite a bit louder than stock, making it easy to hear what you're doing during the heel and toe practice. These are the real deal. These are true, purpose built race cars. They look like it, sound like it, and most importantly, perform like it! For a look under the skin of this car, take a look at The F2000, Unbuttoned. The class is taught on radial tires, but the cars are still capable of cornering at well over 1G. 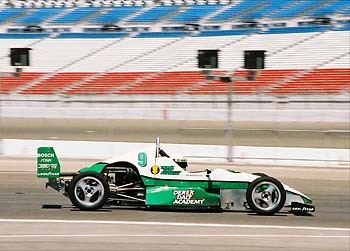 A 1-day advanced class on slicks is available to graduates of this class. The cars balance is similar to the Z3's - although they are of course much faster and lighter, more stiffly sprung, have a lower center of gravity and less body roll.